U.S. government debt yields rose on Monday after European Central Bank President Mario Draghi warned of a pick-up in underlying inflation. The latest meeting by the Federal Open Market Committee is due to take place on Tuesday and Wednesday. A quarter-point bump to the Fed's benchmark rate is factored into investor forecasts. The hike will push the target range to between 2 percent and 2.25 percent. 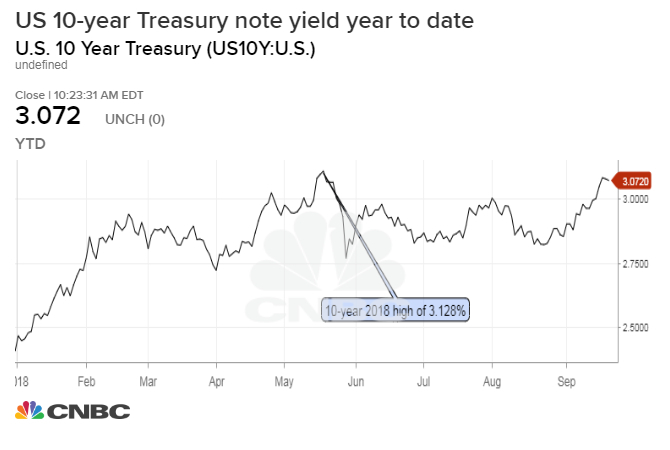 The yield on the benchmark two-year Treasury note hit its highest level since 2008 on Monday after European Central Bank President Mario Draghi highlighted an uptick in underlying inflation in the European economy. The two-year rate hit a high of 2.842 percent in early trading, its highest since June 25, 2008, when it traded as high as 3.014 percent. "Underlying inflation is expected to increase further over the coming months as the tightening labour market is pushing up wage growth," Draghi said in a speech. "This stable profile conceals a slowing contribution from the non-core components of the general index, and a relatively vigorous pick-up in underlying inflation." The yield on the German bund rose 5 basis points at 0.51 percent after the ECB president's speech. The yield on the benchmark 10-year Treasury note held around 3.089 percent at 4:43 p.m. ET, down from a session high of 3.098 percent, its highest level since May 18, when it hit its 2018 high of 3.128 percent. The yield on the 30-year Treasury bond was up at 3.223 percent. Bond yields move inversely to prices. Yields also climbed Monday morning after a report said Deputy Attorney General Rod Rosenstein would resign from his position. The White House clarified later in the day that Rosenstein will meet with President Donald Trump on Thursday to discuss recent news reports that the deputy attorney general once suggested taping the commander in chief. "I think the market dropped a little bit on Draghi's comments, and the German market did for sure," said Arthur Bass, managing director of fixed income at Wedbush Securities. "ECB officials have talked about tapering later in the year, and that the underlying inflation inflation index is expected to pick up." Analysts are also expecting the Federal Reserve to announce a quarter point rate hike Wednesday, and will be paying close attention to the event to see if the central bank provides any signals where monetary policy is heading. Though the Fed is widely expected to hike its benchmark funds rate during the meeting, markets will be looking past this month's decision and toward the direction the Fed will chart ahead. The Federal Open Market Committee's meeting is due to take place on Tuesday and Wednesday. Fed Chairman Jerome Powell will likely discuss the strengthening economy, competitive labor market and burgeoning inflation at a news conference afterwards. A quarter-point bump to the Fed's benchmark rate is already factored into investor forecasts. The hike will push the funds target to 2 percent to 2.25 percent, where it last was more than 10 years ago. "I think you're going to be looking at two things with respect to the Fed meeting. The first is whether they have the word 'accommodative' in the statement," added Wedbush's Bass. "The dot plot is going to be the other thing to look at," he continued. "I think it's more likely they increase. We've been locked in a trading range since May, but I bet people come out of the Fed meeting feeling more bearish." Just last month, the spread between the 10-year yield and the two-year yield hit 19.75 basis points, its lowest level since August 2007. The spread between two-year yields and 10-year yields was last seen at 25.91 basis points. The Treasury Department auctioned $37 billion in two-year notes at a high yield of 2.829 percent. The bid-to-cover ratio, an indicator of demand, was 2.44, the weakest print since December 2008. Indirect bidders, which include major central banks, were awarded 40 percent. Direct bidders, which includes domestic money managers, bought 13.4 percent. Global markets remained jittery on Monday as fresh tariffs that target products in the U.S. and China kicked in and negotiations between the two economic powerhouses appeared uncertain. Washington inflicted 10 percent duties on $200 billion worth of Chinese goods; this is set to rise to 25 percent by year-end. China has retaliated, targeting duties on more than 5,000 American goods worth a total of $60 billion. The Wall Street Journal first reported that China has canceled planned trade discussions with the U.S. as both sides escalate their dispute in the wake of a new round of tariffs.